Earlier version of Fedena didn’t allow its users to allocate special rooms for different classes. 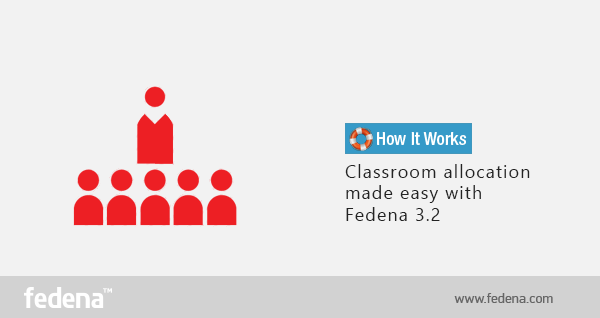 Hence, developing classroom allocation feature was something on high priority and finally, the feature has been released in the newer version of Fedena 3.2. Classroom allocation allows you to create separate classroom for conducting classes. The earlier version of Fedena allowed you to view the timetable which showcased what subject is to be taught, who is the assigned teacher and the time schedule for which the class is allocated. But, in the earlier version, the concept of allocating classroom and building for the particular class to be taken was missing. With Fedena 3.2, you can now know where the class is supposed to be taken. Allocate building and classroom too, for the particular class to be conducted. Read the article and find how you can create and allocate classroom. Login to your Fedena account and go to ‘Timetable’ in ‘Academics’. 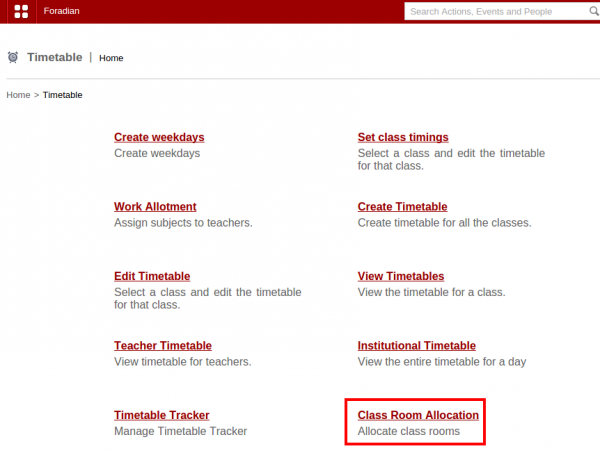 Select ‘Class Room Allocation’ and go to the ‘Class Room Allocation’ home page. Select ‘Manage Buildings’ to add new building and new classrooms to allocate to respective classes. Create a new building and rooms by filling in the necessary information. You have to name the new room and also mention the capacity of each room in the building. Add any number of new room with the help of the option ‘Add field’. Once you are done with creating new building and rooms, you can go to ‘Allocate’ in the ‘Classroom Allocation’ home page. Select the allocation type- Weekly or Date specific. Also, select the particular timetable to which you want to allocate the classroom. 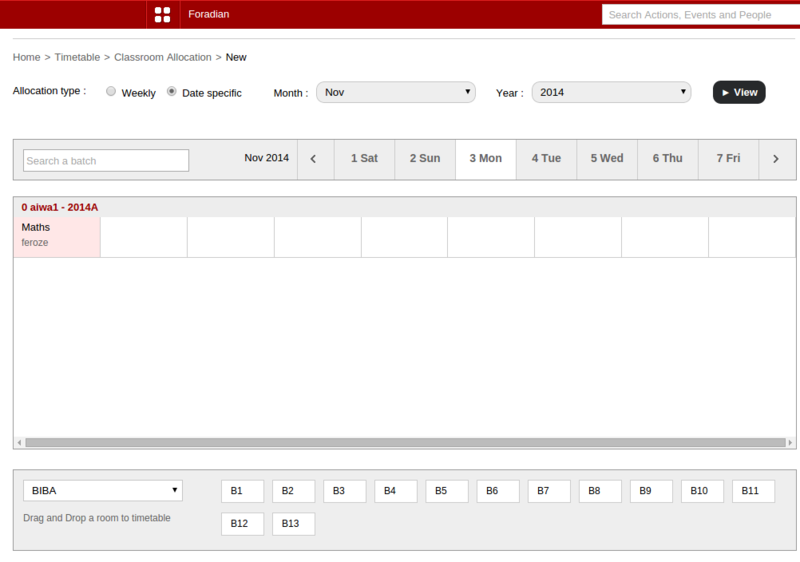 The above screenshot shows how to allocate classroom in case the allocation type is weekly. Select any of the day as well as the building and the particular room and drag it to the subject, as shown by the arrow. This above screenshot shows you how to allocate classroom when the allocation type is date specific. The rest you have to do the same with selecting the building as well as the room and drag it to the respective subject, just like you have done in the scenario shown above. Note: The main difference between the two types of classroom allocation is that, when the weekly format is chosen for a given period of time (suppose from 1st November to 30th November), the timetable range along with the assigned building and classroom for each of the day in the week will be same throughout (in this case, from 1st November to 30th November), unless it is overridden by the date specific classroom allocation. 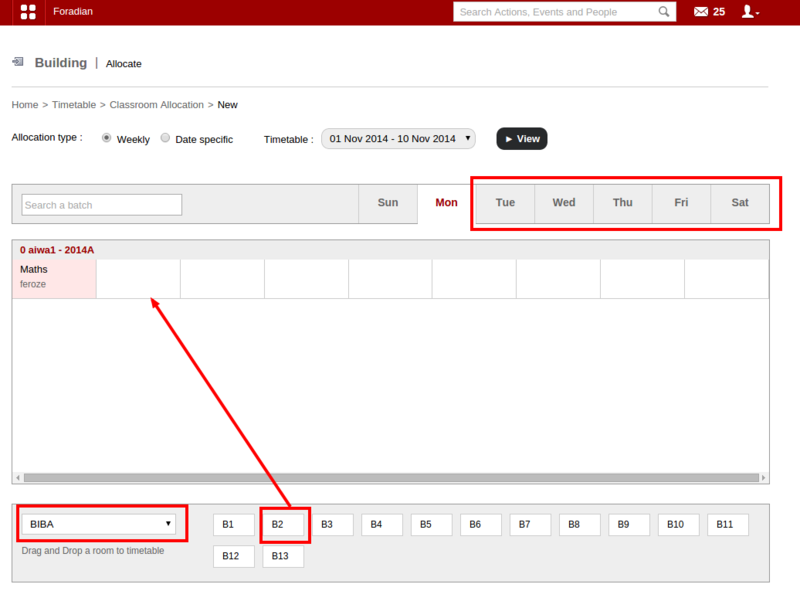 Date specific classroom allocation can override the weekly classroom allocation for the particular date.